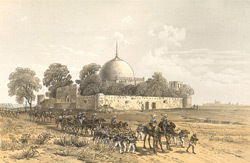 This lithograph is taken from plate 12 of 'General Views of Lucknow' by Sir DS Dodgson. Lucknow flourished in the 18th century under the Nawabs of Avadh who moved their court here from Faizabad. Shah Najaf is the tomb of the seventh Nawab Ghazi-ud-din-Haidar, (1814-27). An imposing domed building set amid gardens, it was occupied by the Indian rebels during the uprising of 1857, directly guarding the route to the Governor's Residency. Dodgson wrote: "[The rebels] defended with great resolution against a heavy cannonade of three hours; Captain Peel, commanding the Naval Brigade, bringing up his heavy guns within a few yards of the building to batter the massive stone walls." At long last an old breach was found and the British troops poured in, ousting the Indian rebels and securing the post.